Home › Community › 9 Months In, 9 Months Out. Please, please, please don’t hate me, but at the risk of alienating you, my dear reader, it is important that I admit at the outset exactly who I used to be. 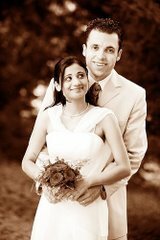 On my wedding day, note the skinny arms. I was that girl that you probably hate, or love to secretly hate – Naturally thin and, no matter what I ate, I stayed that way. Not super skinny, mind you, but always thin. I bought size S clothes without a second thought, wore an XS wedding dress, scoffed at those who frantically counted calories, and was known as the one who’d never seen the inside of a gym; even when that gym was right in front of my Copenhagen apartment, visible from every single window. 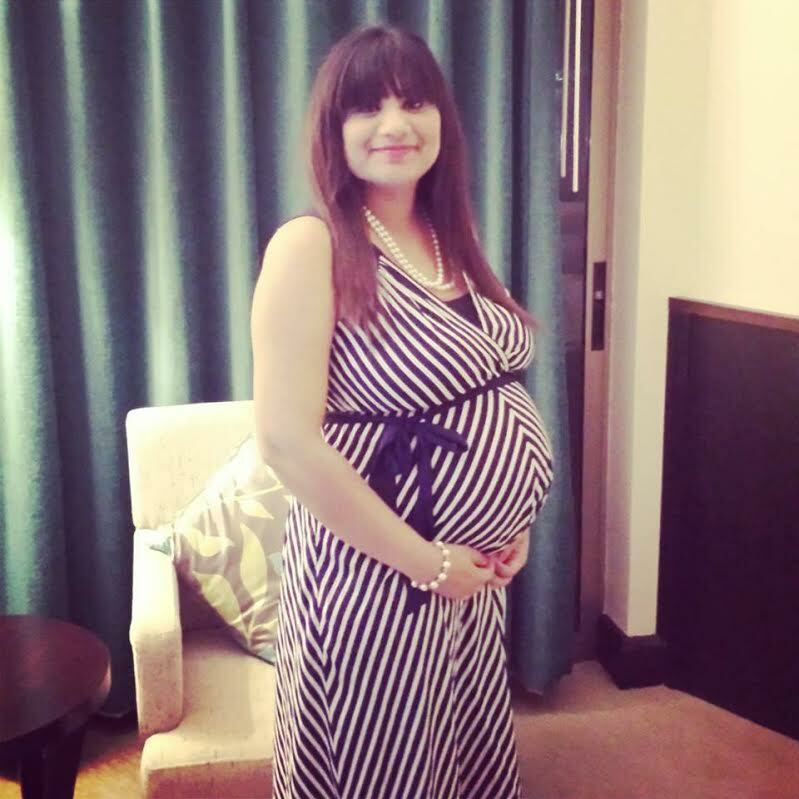 I don’t know what it was – giving up a hectic, full-time job, my 1st pregnancy, moving from Europe to Singapore, a lifestyle change … or perhaps, it was just my age catching up with me as I went from 29 to 30 (And quite possibly, all of the above!) – but, suddenly, the weight piled on before I knew it. 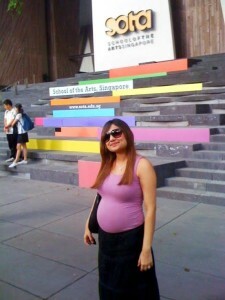 5 Months Pregnant in Singapore with Baby #1. The Post-partum Shock: Is this my new body? In their attempts to explain and educate on pregnancy and its effects on the body, scientists seem to have ignored the direct, and incredibly strong, correlation between breastfeeding a hungry newborn, and eating copious amounts of dark chocolate for breakfast, after lunch, and after dinner. Friends and family told me breastfeeding would help me lose weight; in my case, it was the complete opposite. In those early months of sleep deprivation and marathon feeding sessions, I ate on the go – grabbing a quick bite here and there, and not always making the healthiest of choices. I went from receiving compliments about how good I looked through my pregnancy, to having Chinese aunties offer me their seats on the MRT in Singapore, at 4 months post-partum! When I explained that I wasn’t pregnant but had recently given birth, one of them smirked at me and said “Ah, still got tummy lah!”. Of course living in Singapore at the time, surrounded by petite and genetically-gifted Chinese girls, was just a cruel hand of fate, and I felt fatter and frumpier than ever before! For the first time, and at the ripe old age of 30, carrying an extra 12-15 kilos around, I could actually empathize and identify with friends and acquaintances who had battled with weight for much of their lives. I felt ashamed for not having been more supportive of their struggle to lose weight, now that I could see first-hand how hard it was. Postpartum and weighing a good 15 kg extra. 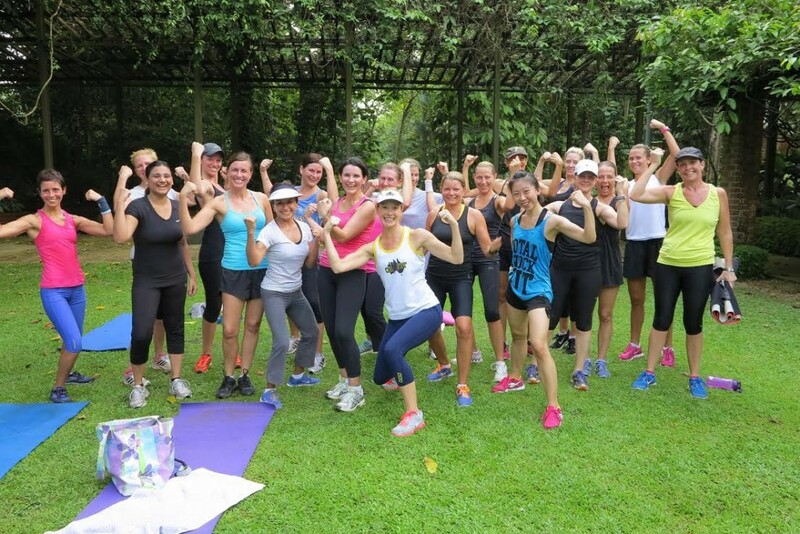 With a close friend and fellow mom, I hesitantly joined a fitness boot camp class held in the Singapore Botanic Gardens, close to where I lived, thinking this might be a good fit for someone like me who hates gyms. I won’t lie – after my first trial session, I was literally puking up air, so unfit was I, and ready to throw in the towel. I had never heard of burpees before, nor done squats, and could barely do a proper push up. Had it just been me, having to exercise alone, I might have given up, but it helped to have a friend there, and to be surrounded by other women in an incredibly open and supportive environment. This kept me returning week after week. 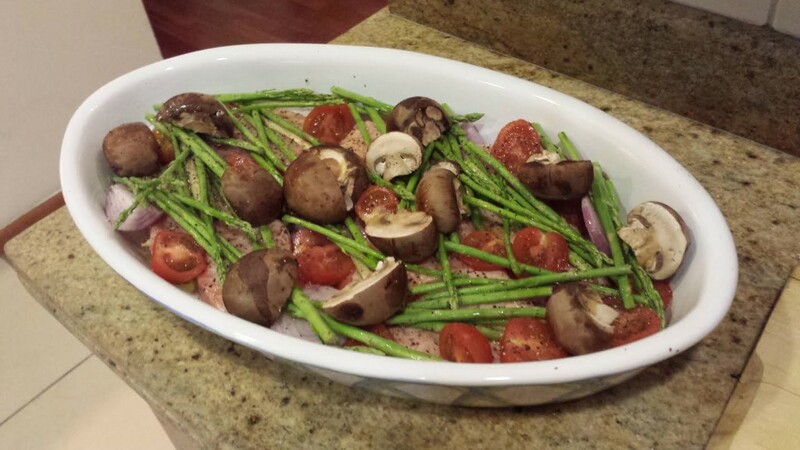 Take a big baking dish and cut your salmon fillets into small squares and place in the dish. Chop up broccoli and sprinkle on top, Half the cherry tomatoes and arrange them in and around the salmon. Chop up mushroom and add them in. Season with Olive oil, salt and pepper to taste. Place in the oven at 200 degrees for 20-25 minutes. Serve with a fresh green salad on the side! Note: This is such a versatile dish. You can add any vegetables that you like including potatoes, peppers, asparagus etc. Or try out different combinations each time! As I soon discovered, though, anyone can exercise for an hour a day, but it is what you put in your mouth over the remaining 23 hours which is even more crucial. As I was still breastfeeding, I didn’t want to embark on drastic dieting. In fact, I really despised everything to do with diets! My plan was simple: I wanted to start losing weight the old fashioned way: exercise and eating right. I cut back, almost completely eliminating sugar from my diet; I reduced my carbohydrate intake (not so easy when you’re a Pakistani married to an Italian, used to either rice or pasta most days) and I started eating a lot more protein, fresh fruit and vegetables. I went six months without having a Coca-Cola, and when I did, it tasted so incredibly sweet like an altogether different drink, now that I had given my body the chance to kick off the sugar addiction! Don’t get me wrong though; there were many times I slipped up. Had that piece of chocolate cake; that late night popcorn with my movie. Didn’t make it to boot camp that week. But after each slip up, I used to think of it as just that – a slip up – and how I could quickly get back on track. 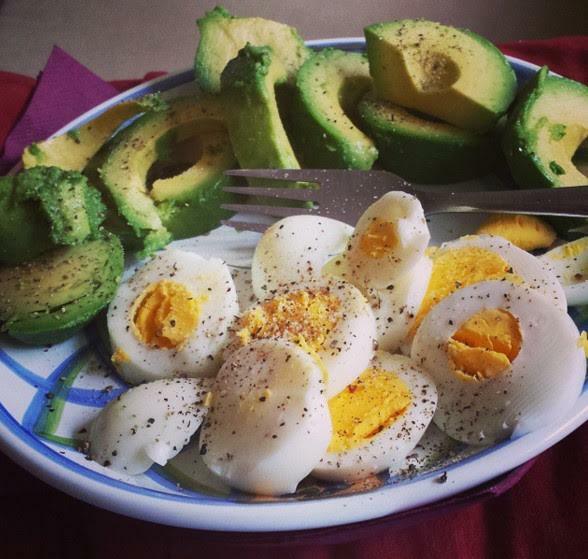 The easiest way to bounce back into my health-and-fitness mode was to plan a nice nutritious breakfast for the next day. 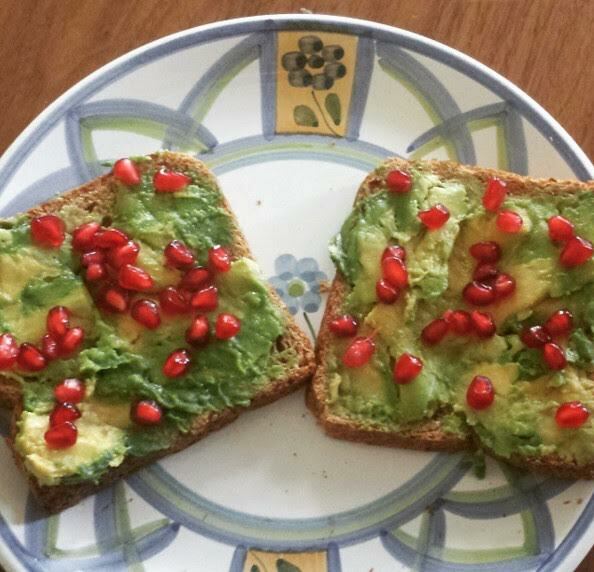 Breakfast is my favorite meal of the day, and I realized that it was instrumental in setting the right tone for the rest of my day – if I ate healthy at breakfast, I was prompted to eat healthy the rest of the day! I came to learn a lot about my body. I already respected and admired it for the way it had grown to accommodate a baby and provide for its nourishment; now as I helped to push it back to its original size and form, I realized it could do absolutely anything – it was my mind I had to conquer. Exercising, keeping fit and eating healthy became such a part of my normal routine that even when I reached my target weight, I carried on, because I realized staying fit actually had nothing to do with losing weight. It became a habit, and a good one; soon I found that any chance I had of some “me-time” away from the husband and daughter, would be happily spent running or going to an exercise class. Fitting back into tailored clothes again – Me in Singapore over Chinese New Year 2014. 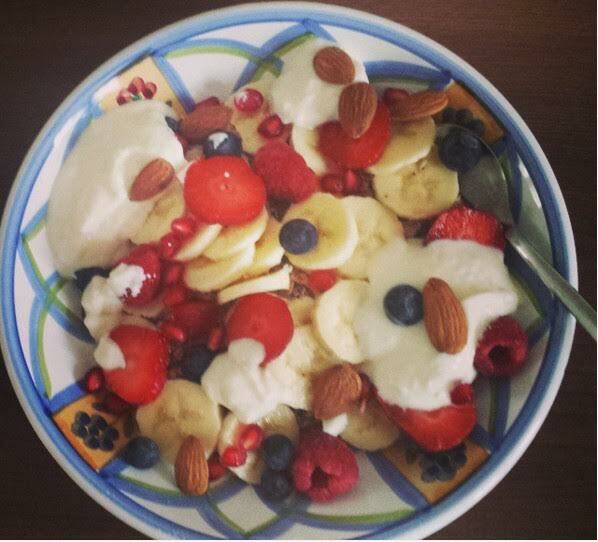 Breakfast Inspiration – Muesli and Greek Yogurt topped with Fruits and Nuts. 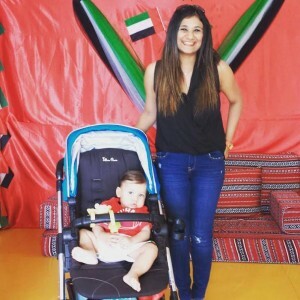 Pregnant with baby #2 in Dubai. When I discovered I was pregnant with baby number #2, I was elated and knew I would do things differently the second time around. 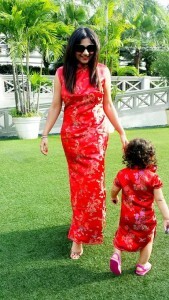 I kept up with light exercise until my 4th month of pregnancy, which coincided with our move from Singapore to Dubai. Being stuck in 50-degree weather in a typical August in Dubai, the only exercise I got most days was chasing after my toddler! Still, I was eating right with the occasional indulgence here and there. Which is why I was gobsmacked to discover at around week 32 of my pregnancy that I was testing positive for borderline gestational diabetes and that my baby boy was measuring to be on the big side! Again, diet played a crucial role in mitigating the diabetes and keeping it under control, although I definitely gained more weight in this second pregnancy. It was all worth it, when our beautiful, baby boy was born at a healthy 4 kilos! (Believe me when I say I felt every ounce of him). The first couple of post-partum months were unsurprisingly spent on the couch, feeding my newborn milk and myself dark chocolate (really, here comes further proof of that correlation!). I’m a strong believer that the first few months after pregnancy SHOULD be spent focusing on nurturing your baby and not worrying about your calorie intake. When the initial 2-month haze had lifted, and my doc gave me an all-clear, I started some light exercise. 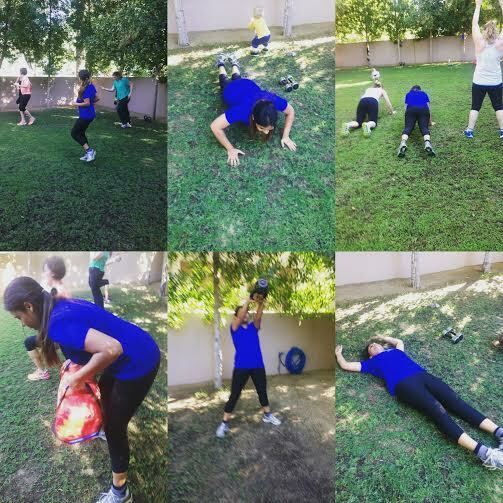 I knew exactly which formula worked for me when it came to losing weight and getting fit again, so I joined a group of lovely ladies in my new neighbourhood in Dubai, who trained weekly with an amazing no-fuss personal trainer. Most of us were moms who had recently given birth, and were looking to get back into shape. The best part was that we could bring our babies to the boot camp class with us! 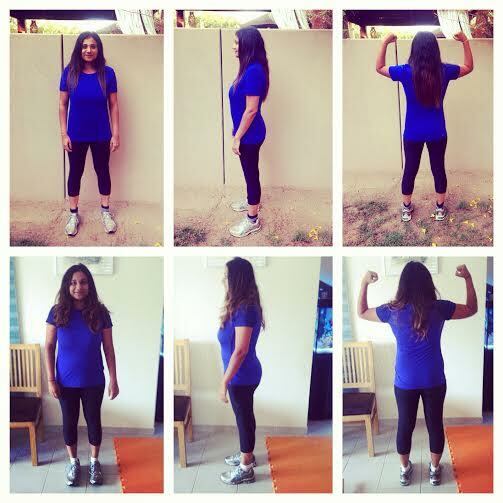 The weight loss was again very gradual and slow – just the way I wanted it. Bootcamp Days in Dubai with B2B Fitness. Before and After shots. The Before pics were taken in April 2015 at 10 weeks postpartum and the After pics were taken in Nov 2015. I lost 16 Kg, 73cm in total and massive reductions in body fat. I am not one who believes, or succumbs, to the popular notion that women should lose weight immediately after childbirth. I was relieved to see Aishwarya Rai focusing more on her baby and motherhood, than on losing weight to suit Bollywood’s (unrealistic) expectations. 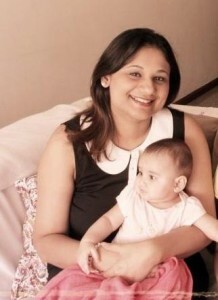 Society’s never-ending fascination with new mothers who snapped back to their pre-pregnancy weight has always irked me! Any magazine you pick up shows you the likes of Jessica Alba, talking about “getting their body back” after giving birth, and making it all sound so easy. Well, it’s not. At least not for us real people. As the popular saying goes “9 months in, 9 months out”. Being pregnant, and giving birth, change women’s bodies in more ways than one; even if you lose the weight, the weight distribution is never the same again, and your body is just different. It is important to be kind to yourself, and to stop comparing yourself to others, which is sometimes easier said than done. 1: Spend the first few months post-partum bonding with your baby and not counting your calorie intake, especially if you are breastfeeding. 2: When you’re ready, find the right exercise for you – if you are an outdoor person, then join a fitness group who run or exercise outside. If you find it hard to stay motivated and committed by yourself, joining a boot camp class can be a great option. 3: Aim for gradual weight loss – that’s safer for you and your baby. 4: Don’t diet; just focus on exercise and eating fresh and nutritious food. 5: Don’t compare yourself to others. Women’s bodies are all different and weight loss is a very individual experience for us all. Me now, 10 months post partum and enjoying fitting back into my skinny jeans! I am currently 10 months post-partum, and finally starting to feel like my old self again. I set myself some fitness goals for the year, and happily completed my first 5-kilometre run after both kids, last month. Things are looking up, that zipper is easier to pull up, those skinny jeans are starting to look good again and it’s a joy to feel your fittest and healthiest self. Motherhood is tough enough as it is; it’s important that we take care of ourselves and our health, in order to take better care of our little ones. 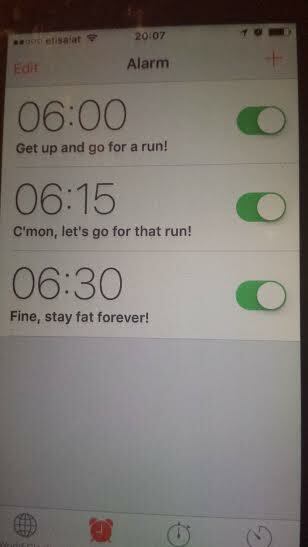 It’s never too late to start, and while you don’t have to be fit to start with, you do need to start to be fit. Give yourself time. Remember you created a miracle. And make one healthy decision at a time. OZFIT/UFIT Bootcamp in Singapore Run by Lisa Clayton (www.ozfit.com.sg). She-fit Classes are only for women and take place at several locations throughout Singapore. B2B Fitness in Dubai (www.b2bfitnessdubai.com) for bootcamp in Dubai. 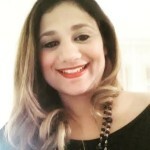 Personal Trainer Sorrell Rawlings is especially knowledgeable about your post partum body and a great personal trainer for anyone looking to get back into shape. Mariam you have pen down your journey in a beautiful way. I am a witness to your struggle becase the kind of a girl you were you would never think of doing exercise. They say that if you have a passion to do something then you really try hard to achieve your goal and I could see that you were very focused in achieving it. Mashallah your article is very inspiring and I am sure a lot of new mothers will benefit from it. Well done and keep it up! Very well written and even better done!